Dissociative identity disorder (DID), is classified as a mental disorder in which at least two distinctly different personality states alternately show in a person’s behavior. There is a strong psychological separation among personalities with each one having it’s own name, age, memories, and abilities. DID was previously labeled “multiple personality disorder” (MPD). The medical phenomena being discovered in multiple personalities stretch the imagination, but researchers believe that they represent only the extreme end of a normal continuum. The effects found in these patients, they say, are graphic examples of the power of states of mind to regulate the body’s biology. By studying them, researchers hope to find clues to links between mind and body that can help people with other psychiatric problems, as well as point the way to powers of healing that may one day be of use in treating normal medical patients. The lesson for psychophysiology from multiple personalities is that a given personality has as its biological underpinning a specific pattern of mental and biological states, according to Dr. Frank Putnam, a psychiatrist at the Laboratory of Developmental Psychology at the National Institute of Health (NIH). In a sense, Dr. Putnam said, there is a “biological self” that corresponds to the psychological self; as the psychological one shifts, so does the biological. Dr. Putnam, who has done extensive research on patients with multiple personalities, is now focusing his interest on how they switch from one personality to another. During the switch, there is typically a period of seconds or even minutes when heart rate, breath rate and other physiological markers show a disorganization, which is followed by a new pattern typical of the personality that is emerging. The biological differences found in the patients, Dr. Putnam believes, reflect the range of states of mind that each sub-personality typically manifests. Many of them are extreme: the terror of a frightened child, the hatred of an avenger. For more than a century clinicians have occasionally reported isolated cases of dramatic biological changes in people with multiple personalities as they switched from one to another. These include the abrupt appearance and disappearance of rashes, welts, scars and other tissue wounds; switches in handwriting and handedness; epilepsy, allergies and color blindness that strike only when a given personality is in control of the body. Throughout the New York Times piece there are anecdotal reports/examples of some of the distinct changes that take place when patients switch personalities. One example is a boy who endures allergic reactions when drinking orange juice including symptoms such as hives and water filled blisters which subside immediately when he switches to a different personality. A key phrase in the article is the fact that examples given by the physicians “represent only the extreme end”. The “Bell Curve” is a general term used to describe a graph of probability distribution. The image of the “bell” is utilized because the “average” of whatever is being measured lies at the highest point in the middle of the graph. 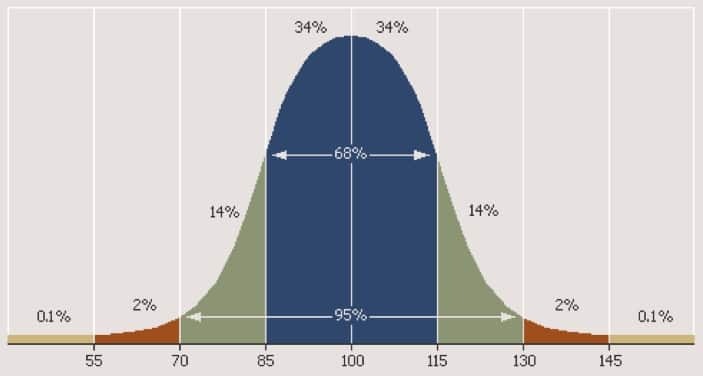 The ends of the bell curve (right and left) depict what would be considered as the “extreme” ends. 74 million people would be considered to be the “extreme” end of the bell curve with both sides split evenly (between left and right) representing 1% of the global population (7.4 billion). That’s not exactly a small number of people when placed in the context of the entire west coast of the United States (including Nevada & Arizona) having a total population of 57 million. A 1985 study in the journal Psychiatry Research would compare 9 subjects with DID versus 10 control subjects who attempted to role-play alter personalities. The study found that there were qualitative differences between the two groups and that simple confabulation is not an adequate model for DID. In 1988, the journal Dissociation would publish a review of studies and clinical observations of DID. The review would encompass citing studies that measured physical symptoms, brain-wave activity (EEG), visual evoked potential, regional cerebral blood, visual refraction, muscle activity, cardiac and respiratory activity, galvanic skin response, and the switch process. In 1989, the Journal of Nervous and Mental Disease would publish a study regarding changes in visual functioning in patients with multiple personality disorder (MPD) compared to control subjects. The conclusions were as follows: “The ratings for clinical significance showed that MPD subjects had 4.5 times the average number of changes in optical functioning between alter personalities of the control subjects, with a mean of 2.56 clinically significant changes for the MPD subjects and .55 clinically significant changes for the control subjects. This difference was also significant. Also in 1989, the journal Psychiatry Research would publish a study comparing 9 patients with DID versus 5 controls. Eight of the 9 DID participants would showcase distinct differences in autonomic nervous system physiology by changing personality compared to controls. In 1992, the American Journal of Clinical Hypnosis would publish a review of published, unpublished, and ongoing studies at the time regarding DID. The review would cite various data points of psychophysiological changes in DID including cerebral electrical activity, cerebral blood flow, galvanic skin response, skin temperature, event-related potentials, neuroendocrine profiles, thyroid function, response to medication, perception, visual functioning, visual evoked potentials, and in voice, posture, and motor behavior. In 2004, the journal Cognitive and Behavioral Neurology would publish a case report regarding a change in handedness (ex: switching from being right handed to left handed) via DID episodes. 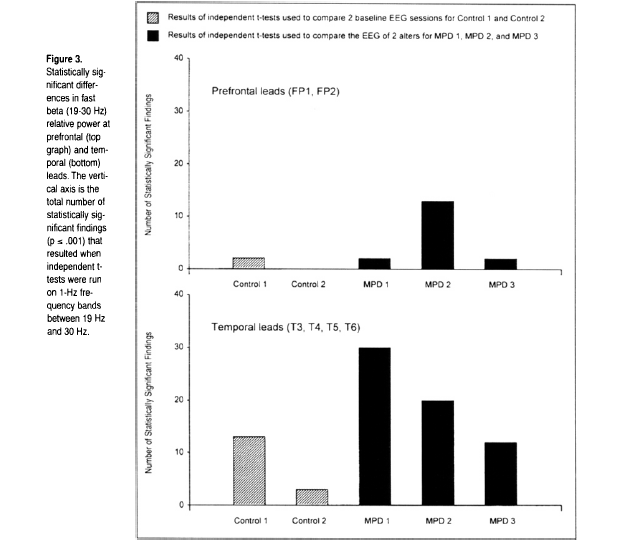 In 2006, the journal Clinical EEG and Neuroscience would publish a study regarding Quantitative EEG measurements of 3 women with DID (MPD) compared to 2 control subjects. The EEG measurements of the DID (MPD) participants who would switched to 2 different personalities varied more than a single control subject. Most of the EEG variability involved Beta activity in the frontal and temporal lobes. How can all this be? Can a person in the same body, in the same place manifest or eradicate physical reactions simply based on distinct changes in brain activity and personality? Based on all of the available data it seems as though there is a high likelihood that this is not only possible but that thousands if not millions of people across the world are showcasing this as of this very moment. According to the book "Adult Psychiatry” it’s estimated that 1 to 5% of the world population experiences DID in some form. Although some of the examples of physiological changes in the body are considered to be the “extreme end” when studying the DID phenomena, the rapidity of changes might offer clues to concepts such as spontaneous remission of diseases. It’s been nearly 30 years since the NY Times article was published and there has yet to be any definitive integration of mind-body wellness within mainstream healthcare systems let alone optimization of it’s potential. Unfortunately it seems as though emotional and physical trauma during childhood appears to correlate with manifestation of DID. There also appears to be anatomical differences in the brain for these people in the form of an atrophied corpus callosum. This would theoretically directly effect the connectivity of the brain leading to the subsequent outcome. 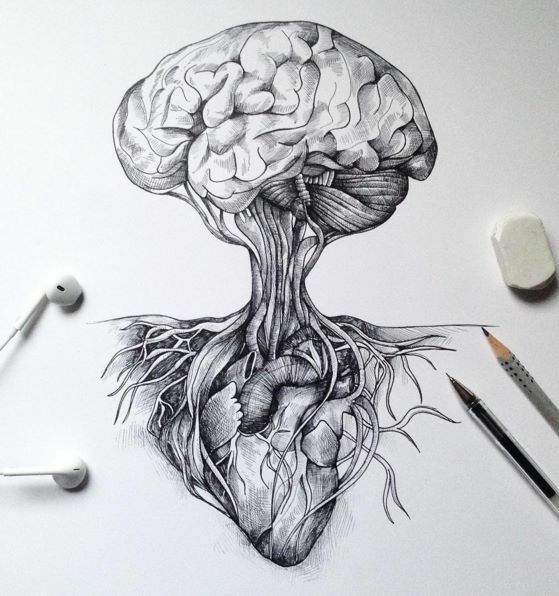 I refer to the brain tree artistry (down below) to speculate about how physiological changes in the body from DID take place with specific “branches” of the brain (neural pathways) signaling the “roots” (organs, specific locations in the body). 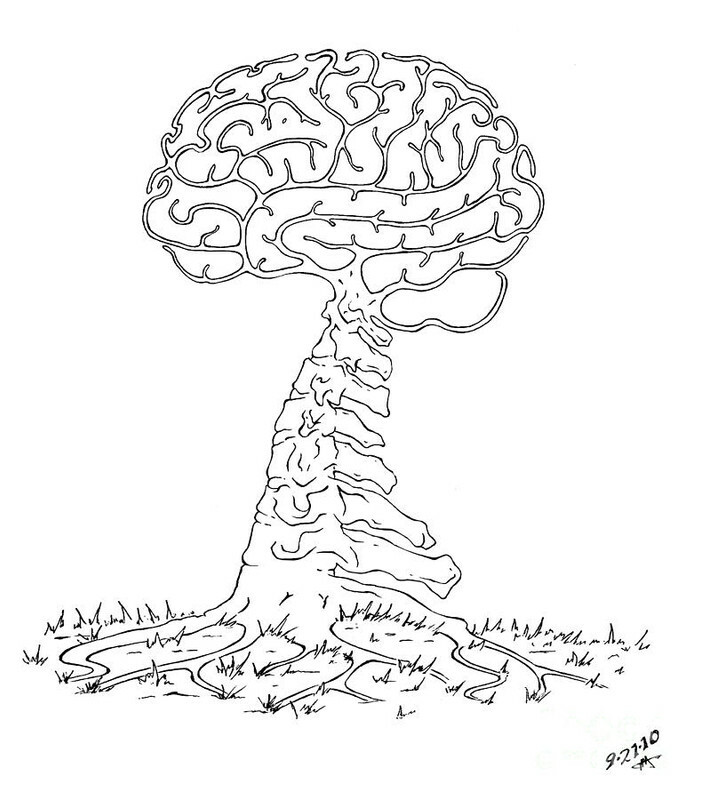 When different branches of the brain are being dominated in terms of usage, specific roots are being signaled. When DID experiencers change personalities, a different set of branches (possibly at different EEG measurements) are activated at different frequencies which coincide with different roots being signaled. We mention the “Bell Curve” earlier as we believe that to study the “extremes” offers the potential to shift a different “bell curve” such as “diseased population” altogether. It seems thus far that to study the “average” will lead to generating “average” results. At some point inquisitive minds will realize that extraordinary results require extraordinary measures. Even in cases labeled as “dysfunctional”… there is magic to say the least. For a more extensive look at the potential effects of DMT synthesis within the body and how they correlate with externalized and internalized experiences read “Measuring DMT Formation in Humans”, 6-part Series on DMT & Gamma Waves as well as the “Wild Theories” series.